Mix the almond milk, vinegar, egg, coconut oil, and honey in a bowl. Whisk until well combined. In a separate bowl, mix the flour, baking powder, baking soda and salt. Pour mixture from the first bowl into the bowl with the dry ingredients, and whisk until a uniform dough is formed. Heat 1/2 teaspoon of canola oil in a non-stick frying pan over medium-low heat. Add 1/4 cup of the dough, and spread with a spatula or spoon, to form a 3-4-inch circle. Cook the pancake on one side, until bubbles appear on the surface. This will take about 3-5 minutes. Flip over and cook on the other side for 2 minutes. Transfer to a plate, add 1/2 teaspoon of oil to the pan, and repeat with the rest of the pancakes. When you have the 4 pancakes ready, assemble the tower by putting a pancake on a plate, a layer of fruit on top of it, then another pancake, and so on. Finish with a layer of fruit, and sprinkle with the grated almonds. Serve with maple syrup on the side, or poured all over it. Make sure the coconut oil is liquid when you use it. If it's solidified you can warm it up in a bowl over the stove on low heat, before adding it to the rest of the liquid ingredients. 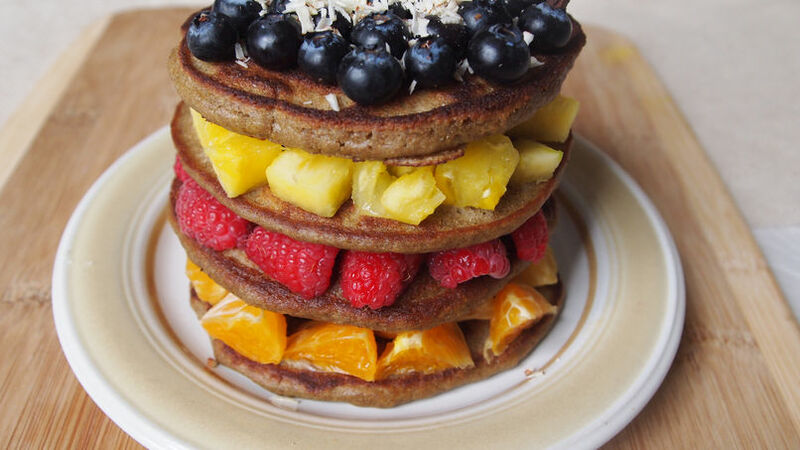 This pancake tower can be tricky to eat as it is. Its appearance is more decorative than functional, and the easiest way to eat it is to disassemble every "floor", and put them side by side with the fruit on top. Otherwise, just let your kids eat it however they want. It will be part of the fun! Want to surprise your little ones on Children's Day? Why not make this colorful and fun pancake tower, and serve it to them in bed? I was lucky enough to have a mom who loved to cook for us when we were kids (in fact, she still does), and who walked the extra mile, bringing breakfast to bed for us almost every morning. But despite this being a habit, it felt special every time, and I still remember it with fondness. If you do this for your kids on this special day, I'm sure they will carry the loving feeling with them throughout the whole day; not to mention the priceless image of their eyes popping with excitement when you walk into their bedrooms with a cool breakfast like this one. There are many fun recipes for kids that are also good for them, and that would make a delicious and unforgettable breakfast. This pancake and fruit extravaganza is one of them, and preparing it for your kids will make this, or any other day, special with a capital S.